5% of your food bill will be contributed to CHALK4PEACE, Inc. What an easy way to make a donation for a worthy cause in the name of Peace! Marielle Mariano, C4P East Coast Coordinator, will be there to answer questions. Mainly Monotypes: Prints by Mary D. Ott at Touchstone Gallery features one-of-a-kind images of ornamental grasses. These colorful and expressive monotypes* are part of Ott's series of more than 40 original prints titled "Bouquets of Grasses." In addition, the exhibit includes screenprints of agaves from Crete and France and landscapes from Washington , DC and the Eastern Shore of Maryland. *A monotype is a one-of-a-kind print. Ott's are produced by creating an image with etching ink on a piece of Plexiglas (a “plate”) and then printing the design on a piece of paper using a hand-operated etching press. Once the design is transferred from the plate, very little of the original design is left on the plate. For this reason there is only one print, a monotype, made from the image that was originally on the plate. a group of arts organizations pushing to convert the unused space underneath Dupont Circle into an exhibition space for experimental artists and curators to hold shows they may not otherwise find space for, for "mid-size" traveling exhibitions that can't find a home in a big museum, as well as a variety of other creative endeavors: fashion shows, video screenings, architectural events, and more.. Warehouse's Paul Ruppert, along with Adam Griffiths from the Washington Project for the Arts, and Julian Hunt, an architect with Hunt Laudi Studio, have formed an "ad hoc committee" as part of the new Artist Coalition for Dupont Underground. ACDU's mission is to fill a hole they feel is missing for art spaces in the city. "It's a central location and a large space that fits a lot of converging interests," Hunt explains. Thanks to avid blogger and art collector Philippa P.B. Hughes for bringing this to our attention. Kay Chernush, Mary Coble, Frank Hallam Day, Jason Horowitz, Lucian Perkins and Athena Tacha. In contrast to the standards of the media and the fashion world, exhibiting artists for Uncommon Beauty will stake out alternative perspectives. While they are important topics, the overall focus of the exhibition is not our society’s obsession with diet fads, obesity, and cosmetic intervention. Instead, the exhibition seeks to investigate the underpinnings of beauty and imperfection; how standards and ideals become formed and perceived; and the dynamics of self-esteem, self-hate and acceptance. The intent is to offer something different, unexpected, positive, or ambivalent; something that problematizes the notion of beauty without merely bashing it. Artists' Talk and Opening Reception: Thursday, October 2, 5:30 p.m. - 9 p.m. Dress: Your interpretation of "Uncommon Beauty"
Personal Identity and the Disjunction of Public Perception: A Discussion with Kay Chernush and Mary Coble: Thursday, October 16, 7 - 9 p.m.
Art Eyes Happy Hour: Friday, November 7, 7 - 9 p.m.
Everyone is welcome to personally interact with select Uncommon Beauty artists as we connect the Deaf and Visual Arts communities. Art Eyes is designed to create dialogue, art critique among peers and interpretation of artworks. Their mission is to empower the Deaf community to become move involved in the Visual Arts. Targeted audiences include all artists, art lovers and art-curious. ASL interpreters will be present and parking is free/open late for the reception, discussion and Art Eyes happy hour. Please note: "Uncommon Beauty" exhibits photographs with adult content that may not be suitable for children. Parental discretion is advised. Kate Smith of Sensational Color interviewed me for Views on Hues this past spring. The interview is featured on Kate's Sensational Color website, www.sensationalcolor.com. Enjoy a special event featuring 11 visual artists, guest DJ Munch, and a special appearance by GRAMMY Winner: TONY RICH (Hidden Beach Records). His new CD "Exist" will be available to be autographed. Complimentary beverages, light food, plus giveaways/dooor prizes provided.This event is powered by Art Whino Groove Arts Collective It is sponsored by Scion, Vitamin Water, Honest Tea. If you missed the opening now is your chance to catch it on Thursday, September 25, 7pm-11pm. The show ends next week. Honeylab DJ's blowing up the spot all day. Some of the featured DJ's are DJ Mikel Panda and Eddie Twain. Tons of Art on Display! Crafty Bastards will be selling their handmade wares at the 5th Annual Crafty Bastards Arts Crafts Fair. The festival will take place Sunday, September 28th from 10am-5pm at the Marie Reed Learning Center in the Adams Morgan neighborhood of Washington, DC. Reception: Thursday, September 25, 5:00 to 7:30 p.m.
Gallery Talk at 5:30 p.m.
Washington, DC artist Karlisima is interviewing for mural volunteers for a large project in Adams Morgan. Join Betty N. Smith in the Oil Painters of America Western Regional Exhibition. The show runs through October 11th. Watch this title for Artists working in the USA. I'll be periodically posting images from different locations in the country. Although widely proclaimed dead in the 1980s, painting has returned to prominence in recent years. This symposium will examine the state of contemporary painting from a range of perspectives, embracing the artist's point of view and those of the art historian and critic. "Color/Line" with Yve Alain Bois, Spencer Finch, Andrea Pollan and Joseph Marioni at 2:15 pm. The fee for "Symposium: Painting in the 21st Century" is included in museum admission. Don't miss this event on TUESDAY!! MORE art & a party! We're at the halfway mark today. Our work schedule has been 9:30 - 5:30 daily. Since it's Saturday, we started an hour later and finished an hour earlier leaving time for the assistants to play in the evening. I'm doing inventory of how much more paint and supplies we will need. We had more visitors and great comments today. Saturday and the team tunes in to the color RED. John Grunwell joins us for a day. A day's work on Prism Mural, Crystal city, VA.
DC mural and mosaic artist G. Byron Peck leads a bicycle tour of the recently installed 1,200 foot-long mosaic artwork decorating the South West Gateway. Peddle along many of the waterfront sites that inspired the mosaic’s imagery, then travel down Maine Avenue to view a second mural located near the Corcoran School of Art. Student apprentices with City Arts, a non-profit that mentors underserved youth to create public art, contributed to both works. Presented by City Arts. Reception: Friday October 3rd, 6:30-9:30 p.m.
Imagining Ireland: Sky, Land, Sea, an exhibition of landscape painting sponsored by the Embassy of Ireland, will feature the work of three well known painters, two from Ireland and one from the US. 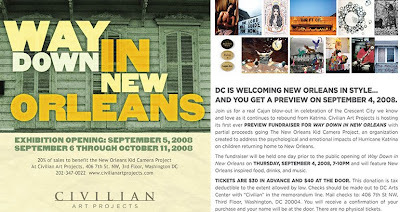 The exhibit opens on Friday, October 3, 2008 at the Arts Club of Washington, which is the historic James Monroe House in Washington, DC. 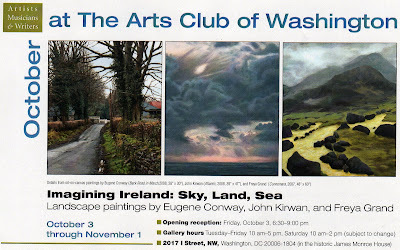 Irish painters John Kirwan and Eugene Conway, from the Molesworth Gallery in Dublin, along with Washington DC painter Freya Grand, will mount a large exhibition of work that illuminates the rocky coasts, the dramatic skies and the damp, silent country roads of this beautiful country. All of the artists will be present at the opening reception. As Mayor Adrian M. Fenty continues to move forward in transforming the District of Columbia into a premier, world-class city, today he announced three new District agency directors and one new board appointment. Gloria Nauden is the founder of Radar Entertainment Group, a District-based boutique marketing and video production company. Radar provides specialized marketing services to companies such as Verizon, Lincoln Mercury, Moet Hennessy and XM Satellite Radio. Nauden previously worked as an executive at Black Entertainment Television in the Strategic Business Development division successfully managing a $12 million development budget with 250 employees spanning three states. Nauden has lived in the District for almost 20 years, and serves as a volunteer at numerous civic organizations including, Parklands Community Center; Sasha Bruce House; Foods & Friends; The Covenant House; Thurgood Marshall Center; and House of Ruth. Nauden currently serves on the DC Arts and Humanities Commission. Opening reception: Saturday September 20 from 5-8pm. The exhibition was curated by Sondra N. Arkin. Each artist is exhibiting one work 20x20 inches. WPA will run a show in the second gallery Hillyer Art Space while the main gallery features a solo photography show by artist, Phuong Do. The dual show will run in conjunction with the city-wide Fotoweek events. The WPA show was curated by Amanda Maddox from the Corcoran Gallery of Art, who made her selections using the Artfile Online database. Yours truly is on a mural project across the river in Crystal City, VA. I'll be working on the project for several weeks and then I'll come to see you again. The mural is called Prism and it's a color poem, full of light. You can take a peek at what I'm doing by visiting the blog, On The Wall, http://muralwalls.blogspot.com/. When you're ready in two weeks, come on over and take a look at it. You can hop the metro and be right there. It's at the Route 1 Overpass along 18th Street just outside the Crystal City Metro Stop. See you there! The Crystal City Business Improvement District commissioned Washington-based artist Anne Marchand to add a colorful mural to the Route 1 Overpass along 18th Street. The piece, titled Prism, will welcome pedestrians and cars entering and exiting the Crystal City Neighborhood along 18th Street. The mural will be painted on thirty five concrete panels sized 4 feet x 9 feet spanning the length of the 160 foot wall. The design phase of the project began in July and the fabrication is taking place in September 2008. The mural will be created in vibrant hues that reflect a theme of light and color. Sign-up for poets is at 6 p.m. The open mic begins at 7 p.m. Hosted by Fred Joiner, curator and host of the American Poetry Museum's Intersections at the Honfleur Gallery and poet in residence at Busboys and Poets, Shirlington. This month's feature poet is Drew Anderson. New Orleans bred hip hop artist, spoken word poet, host, screenwriter and high school teacher Drew Anderson, aka "Droopy the Broke Baller," utilizes his talent in innovative ways to connect with audiences big and small via the avenues of art and education. A fixture in the D.C. spoken word scene for more than 10 years strong and two-time DC/Baltimore National Slam Team member, Anderson has a writing resume that includes two solo publications and numerous collaborative projects. He is a co-founder of the award-winning Straight, No Chaser Productions film company, dedicated to giving voice to underexposed characters and lending reality to unconventional worlds. Dana Ellyn and Matt Sesow took a month long trip to China. In lieu of their annual 31 Days of July series, Dana and Matt are exhibiting exciting work made while on their trip to China. A solo exhibition of new works by New York-based artist MICHAEL SCOGGINS . Making reference to Naive Art and Art Brut, Scoggins creates large-scale trompe l’oeil replications of scrawled sheets of notebook paper to voice obscure political and psychological opinions. When he reveals his ostensibly personal views and emotions, he does so in a manner that is direct, but distorted by humor and irony. Scoggins’ scrawls feign a child’s perspective to make self deprecatory statements, jab at the political state of America and mock our social values. He achieves this by using fundamental and childlike imagery, language and materials —paper, markers, colored and graphite pencils and crayons. In this newest body of work, Scoggins comments on a range of issues spanning Washington, D.C.-gun control politics to mean girls. The works strive for grandeur in their larger than life size and boldness, but are restrained by the adolescent angst that remains to some degree in everybody. Seating is limited, to reserve a space for any of the workshops please call 410-962-8565. Washington, DC – Black Artists of DC (BADC) announced this month that they will host a one day “open studios” show and sale of their members’ work in order to raise funds to support Democratic Presidential nominee, Barack Obama. Forty celebrated artists from the Washington/Baltimore area - with original work that ranges in style, includes all media, and showcases techniques extending from the ancient to the innovative - will open their studios to the public on Sunday September 28, 2008 from 11:00 am -- 5:00 pm to help raise money for the Obama campaign. According to group convener, Aziza Claudia Gibson-Hunter, “Throughout history, Art has been used as a vehicle for social and political change. We wanted to add our voices and efforts towards POSITIVE CHANGE. The event offers art lovers and collectors the unique opportunity to visit and view the works of various artists in their own studios. The public will be able to purchase original paintings, prints, wearable art, textiles, jewelry, ceramics, photography, sculpture and much more while supporting the campaign. Twenty percent of sales proceeds will be donated to the Obama campaign in the name of the art purchaser. We prefer checks for bookkeeping purposes. Adamson Gallery celebrates the beginning of the 2008 - 2009 season with a selection of some of the newer work from Adamson Editions, including work from Chuck Close, Roni Horn, Victor Schrager, Adam Fuss, Jenny Holzer, iona rozeal brown, Renate Aller and Robert Rauschenberg. Like Adamson Editions, these artists take pleasure in combining traditional and groundbreaking forms and techniques. Together, these pieces show the extraordinary breadth of Adamson's collaborations, as well as illustrate the way in which the atelier continues to make innovations in the exciting new field of digital printing. David Fogel and 88 DC are notorious for throwing their monthly 'X' theme parties at BeBar on 9th Street. This month they're hosting a benefit for WPA as part of the DC International Art Expo being held all weekend at the Convention Center. Susan Klebanoff and Joan Konkel's create eye catching sculpture with surface delight and whimsy. The work is on display at the Zenith Gallery's Singular Vision Exhibition. Susan Klebanoff's mutli-layered tapestries sparkle with light and color. Joan Konkel uses aluminum sheet metal and mesh that create depth and luminosity through her surfaces. Julie and Ken Girardini both create functional art and furniture in steel. Scenes from Washington, DC's Annual Arts on Foot Festival this past weekend. This year was twice as large with dance perfomances and music scheduled throughout the day. DC Artists, Matt Sesow and Dana Ellyn are two of the artist participants exhibiting exciting new work. Gallery Hours: Saturdays, 10:00am - 4:00pm and by appointment with Hemphill Fine Arts. For information call (202) 234-5601. Sponsored by Taurus Development Group and Hemphill Fine Arts. Artists Ruth Jarman and Joseph Gerhardt, aka Semiconductor, have collaborated since 1999 on various forms of “digital noise and computer anarchy,” including films, experimental DVDs, and multimedia performances. The London-based pair makes moving-image works that reveal our physical world in flux: cities in motion, shifting landscapes, and systems in chaos. They strive to transcend the constraints of time, scale, and natural forces and explore the world beyond human experience, questioning our very existence. Among the shorts featured in the Black Box is Magnetic Movie, 2007, an eye-dazzling “documentary” created during the artists’ residency at the NASA Space Sciences Laboratories, UC Berkeley. The secret lives of invisible magnetic fields are exposed as chaotic ever-changing geometries. VLF (very low frequency) audio recordings reveal recurrent “whistlers” produced by fleeting electrons, while space scientists describe their discoveries. As we watch the film it’s not clear: Are we observing a series of scientific experiments, the universe in flux, or a documentary of a fictional world? Magnetic Movie was awarded best film at Cutting Edge and at the 2008 British Animation Awards and best experimental film at the 2007 Tirana International Film Festival. Joseph Gerhardt was born in 1972, Oxford, England, and has a bachelor’s of arts in sculpture from the University of Brighton. Ruth Jarman was born in 1973, Fareham, England, and has a bachelor’s in critical fine art practice from the University of Brighton. September 17 - October 8, 2008. Reception: Thursday, September 18 from 6 to 9 pm. This group show features works twelve local artists who explore our diminishing zone of personal privacy and reflect on all of the ways we are watched, listened to, recorded, categorized and observed. Scott G. Brooks, Groover Cleveland, Richard Dana, Anna U. Davis, Aziza Claudia Gibson-Hunter, Rosemary Luckett, Elizabeth Morisette, Ann Stoddard, Tim Tate, Ruth Trevarrow, and the curators themselves. For quite some time, we have observed with concern, anger and even fear the increasingly diminishing zone of personal privacy available to any of us, the freedom to speak, write, believe, read, travel, even think in complete privacy. We have quickly become accustomed to random pat-down searches and shoe removals at the airport; these seem benign by now, as does as the inability to enter virtually any office building without producing identification and, in many cases, going through a metal-detector. to and tacitly accepting of these as well. We have already accepted the incredible proliferation of cameras throughout our cities that record our physical presence as it moves through space throughout the day. Nor is surveillance by any means limited to the government. The internet has facilitated an enormous amount of data collection about our purchases, our viewing habits, our homes, our friends and business connections, the groups we belong to and support. Short of disconnecting from the modern world completely, there is not much we can do to find a truly inviolate private space. The intention of the “Under Surveillance” is to encourage viewers to reflect on the many ways in which we are watched, listened to, observed, monitored, photographed, categorized and filed away for future reference – and to think about the appropriate action. September 18th - Saturday, October 25th. A new fall market in bustling in Crystal City in Arlington, Virginia. This is a juried crafts, collectibles and gift market featuring a diverse display from exhibitors of many types of merchandise, as well as prepared food vendors. Crystal Market operates every Thursday through Saturday for 6 weeks. It opens on Thursday, September 18th, and will run for 18 days thru Saturday, October 25th. Market Hours: 11:30pm-6:30pm each day. There are two special event Sunday markets scheduled in coordination with Vintage Crystal, a wine festival, on Sunday, September 21st and the Marine Corps Marathon's leg through Crystal City on Sunday, October 26th. The market is located in the park at 2121 Crystal Drive directly across the street from a popular strip of restaurants, retail, and entrances to the Crystal City Shops. The Crystal City Metro is a short walk, 3 blocks away and plenty of public parking (free garage parking on weekdays after 4 PM and all day on weekends) is available nearby. Project 3: Empowered by Artistry, a collaborative effort of three initiatives including the Making Herstory Series under the title La Femme: The Feminine, an exhibition featuring women artists from the DC Metropolitan area. Artwork selected for La Femme portion of the exhibition is based on the theme of the power and softness of women. "Better now than they once was," a site-specific installation sponsored by HEMPHILL and Taurus Development. VSA arts and Volkswagen Group of America, Inc., present “Green Light,” a juried exhibition by emerging artists with disabilities. The exhibition includes video, drawing, digital prints, sculpture, and painting. The theme “Green Light” challenged artists to consider the motivations behind their work and the infinite possibilities that creativity provides. Touchstone artists interpret this theme freely and broadly. 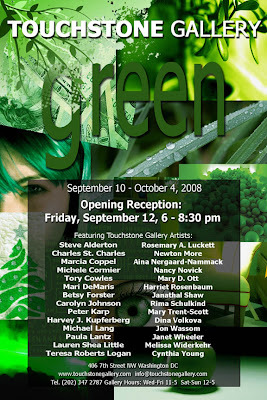 GREEN is approached literally or conceptually, and artists’ responses encompass green as a color, as a movement, as a state of being, as a symbol of life. Steve Alderton, Charles St. Charles, Michele Cormier, Marcia Coppel, Tory Cowles, Mari DeMaris, Betsy Forster, Carolyn Johnson, Peter Karp, Harvey J. Kupferberg, Rosemary A. Luckett, Michael Lang, Paula Lantz, Lauren Shea Little, Teresa Roberts Logan, Newton More, Aina Nergaard-Nammack, Nancy Novick, Mary D. Ott, Mary Trent-Scott, Janathal Shaw, Harriet Rosenbaum, Rima Schulkind, Mary Trent-Scott, Dina Volkova, Jon Wassom, Janet Wheeler, Melissa Widerkehr and Cynthia Young. The Fraser Gallery presents a solo exhibition of new paintings by acclaimed artist, David FeBland. Opening Reception, in conjunction with the "Bethesda Art Walk" will be held on Friday, September 12, 6pm - 9pm. Hackett’s recent work focuses on body language, physical traits, and specific characteristics of selected animals as a structure to develop various multimedia works. Growing from initial impulses such as heart rates, body language, bones, and fur, the work pushes and pulls between the synthetic and the natural suspended in ambiguous hypnotic manifestations. 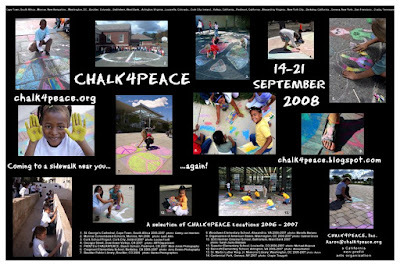 From its beginnings in 2003 at The Museum of Modern ARF in Arlington, VA, as a Sunday sidewalk chalk project for children, to its recognition by the Arlington Arts Commission, the DC Commission for the Arts and Humanities, the DC Mayor's Office, the Humanities Project of Arlington and Whole Foods Markets, CHALK4PEACE has grown through the efforts of hundreds of events organizers, teachers, parents, community outreach coordinators, libraries, arts centers and other peace minded individuals and organizations. Over the past two years, Fullerton-Batten has been gaining critical recognition for her "Teenage Stories" photographic series. She has had solo exhibitions in London, Madrid, Paris, and Berlin, as well as winning the HSBC Foundation Award for Photography in 2007. Her book "Teenage Stories" won the PDN 2008 book of the year award. Her work, which deals with the dynamics of adolescence, calls attention to the period in a young girls life when she is faced with the growing responsibilities of her teenage years, yet still unable to disengage from the fantasy life of a child. Features work by ten emerging Mexico City based artists, ID-entity will be presented at Transformer and the MEXICAN CULTURAL INSTITUTE. New work by Saúl Gómez presented throughout Transformer's project space. TRANSFORMER, 1404 P Street, NW, Washington, DC. Discussion of work between ID-entity artists and Ryan Hill, Manager of Interpretive Programs and Curatorial Research Associate, Hirshhorn Museum and Sculpture Garden. Seeking to further international contemporary art dialogue, build alliances for artists, and promote cultural exchange, Transformer is partnering with the Mexican Cultural Institute in presenting the comprehensive ID-entity exhibition. Presenting work that reflects issues of living within a capital city, urban life, as well as larger issues of identity both national and personal - Domestic Fine Arts, Gilberto Esparza, Saúl Gómez, Ricardo Harispuru, Mauricio Limón, Edith Pons, Xavier Rodríguez, Marco Rountree Cruz, Amaranta Sánchez and Joaquín Segura, several of whom will be exhibiting in the US and/or DC for the first time - present photography, video, painting, drawing, and mixed-media work in site-specific and site-responsive installations throughout Transformer and three floors of the Mexican Cultural Institute's public rooms. ID-entity is co-curated by Transformer's Executive Artistic Director Victoria Reis and Mexico City based independent curator Giovanna Esposito Yussif. Some of the most extraordinary art in the world today is being created by Aboriginal men and women in remote communities throughout Australia; it is radical, contemporary, beautiful and alive. Gallery Sydney-East represents today’s finest established and newly emerging Australian Aboriginal artists, with particular emphasis on paintings, sculpture and glasswork from the indigenous communities of Western & Central Australia. Longtime new urbanist Jeff Speck will speak next week at the National Building Museum on land use codes for livability. Jeff will be introduced by CNU DC board member Lee Sobel. Jeff Speck, AICP, LEED-AP, former Director of Design at the National Endowment for the Arts, Director of Town Planning for Duany Plater-Zyberk & Co., and co-author of Suburban Nation and the forthcoming Smart Growth Manual, discusses the often anti-urban nature of today's land-use codes, and proposes alternative rules for the creation of more livable communities. He also shares the story of his attempt to build a new infill house in Washington, DC and how he overcame the legal barriers to ultimately build a 2000-square-foot solar-powered home on a 500-square-foot lot at the tip of the L'Enfant plan. 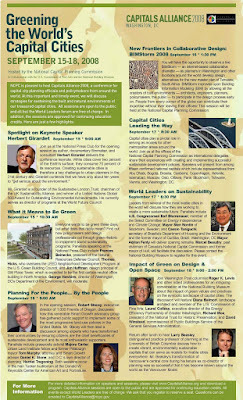 Smart Growth is presented in association with the U.S. Environmental Protection Agency and the Smart Growth Network. Robert Genn, one of Canada's most accomplished painters, gives us an update on the new Golden Paints Open Acrylics slow drying acrylics. Golden Paints has introduced a new line called Open Acrylics. The idea is to offer acrylic painters a chance to really relax and take their time without the business of quick drying as in normal acrylics. The new product stays wet or tacky up to ten times longer than normal heavy-bodied acrylics. Further, they can be worked together with the standard products and made to speed up or slow down drying times according to percentages mixed. I've been using them straight up and in various mixtures for a week or so, and I like them. Right out of the tube, or with the special thinner, you can be positively languorous--even in direct sunlight. I was blown away. They mix and blend like a dream, and false starts and boo-boos can be scrubbed into oblivion or gradated away with a rag. They stay water-miscible, so you can get effects you can't get with the regulars. There are a few things you have to watch out for. The Golden Product Information Sheet is worth reading before you begin. For starters, the dedicated thinner contains no binders. It looks to me like there are a minimum of acrylic binders in the pigments anyway--but there is a volatile medium that is slow to evaporate. Golden recommends 30 days drying before final varnish. I found that once things were going nicely I could force dry with moderate heat. This may not be advisable. Acrylics in general require curing rather than drying. Further, adherence or clouding problems may arise if you pile impasto or a regular glaze on an uncured surface. My advice is to consciously take a little longer between stages. This is good for the old creativity machine as well. Especially for those of us who multitask, the use of Open Acrylics takes the pressure off and lets you fool around more. Because the Open Acrylics still have Golden's trusted richness, you can cut down your palette. I've been working with a small kit of six pigments: Titanium White, Hansa Yellow Opaque, Phthalo Blue (green shade), Phthalo Green (blue shade), Pyrrole Red, Quinacridone Magenta. You can mix some mighty sophisticated hues, including gorgeous darks and earth tones, from this tiny outfit. It's an education. 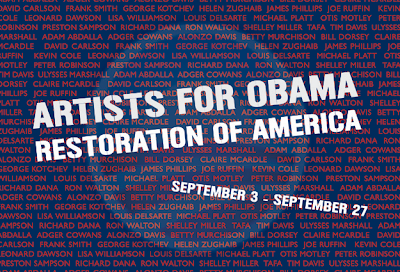 An exhibition of twenty six artists from many parts of the United States expressing themselves through art about Presidential candidate Barack Obama. Artists were asked to create an image that may touch on issues such as civil rights, disabilities, education, energy and environment, ethics, faith, family, poverty, Iraq, service or just simple portraiture of Obama, his life, his faith, his truth. 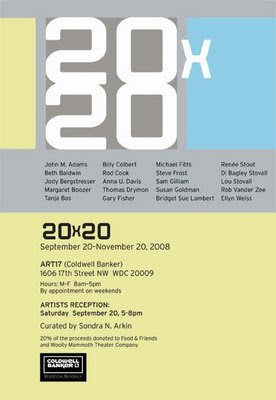 The following artists will be participating in the event/exhibition; Adam Abdalla (Virginia), Adger Cowans (Connecticut), Alonzo Davis (Maryland), Betty Murchison (Maryland), Bill Dorsey (DC), Claire McArdle (Colorado), David Carlson (Virginia), Frank Smith (Maryland), George Kotchev (Virginia), Helen Zughaib (DC), James Phillips (Maryland), Joe Ruffin (DC), Kevin Cole (Atlanta), Leonard Dawson (Alabama), Lisa Williams (Kentucky), Louis Delsarte (Atlanta), Michael Platt (DC), Otis Motley (Maryland), Peter Robinson (DC), Preston Sampson (Maryland), Richard Dana (DC), Ron Walton (New York), Shelly Miller (DC), Tafa (New York), Tim Davis (Virginia), and Ulysses Marshall (Maryland). 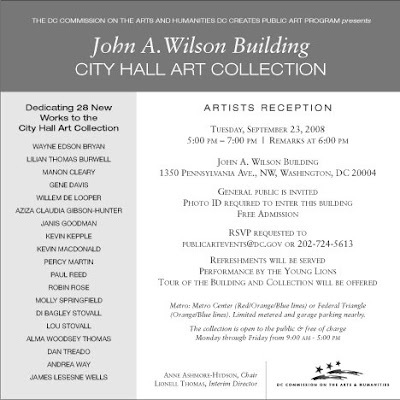 The chosen artists have their art works as part of permanent collections such as; The John A. Wilson Building-City Hall Collection, The Smithsonian, The Corcoran Gallery of Art, The David Driskell Center, University of Maryland, Howard University, Washington Convention Center, and many corporate and private collections. This will be a multi-media exhibition that may include paintings, photography, video, prints, mixed mediums and sculptures. Opening Reception: Friday, September 5, 2008, 6-9 p.m.
Fragmented Light consists of original photographic material of Keramicos, an ancient cemetery in Athens, Greece, printed as Platinum Palladium prints. Vandorou uses an eclectic mix of photographic techniques spanning three centuries of photography to create a series of images that convey a sense of time passing, the brevity of life, and the fragility of both. Exhibition developed and coordinated by International Arts & Artists, Washington DC in conjunction with the Embassy of Greece. Paul Reuther was recommended by Frank Wright and approved by the Local Artist Advisory Committee for his unique talent and visions. Ten Miles Square, a venture to promote emerging photographers in the Washington, D.C. area is partnering with the Pink Line Project to curate and host a show during FotoweekDC, call for entries. The exhibit will feature the "theater" of D.C. Artists may submit 4-6 images that show a scene or a narrative of something culturally relevant to the Metro area. Send in your work in low to mid res format by midnight on Saturday, October 4, 2008. Marking its 16th anniversary, Arts on Foot is a one-day, multimedia Festival that kicks off the fall arts season in Downtown DC’s Penn Quarter. Incorporating visual art, music, theatre, dance, film, and creative cuisine, it’s an interactive celebration the whole family will enjoy with a lively outdoor street festival as its centerpiece. Anne Marchand is looking for a mural assistant who can work on an exterior public art mural project in Crystal City, VA in Mid-September for 3-4 weeks. Assistant must be able to draw and provide own transportation, site is metro accessible. Mural Assistant work description is onsite prep work, drawing, painting, accurate taping, some heavy lifting, clean up and other on site work, working on a small scaffold and working well with instructions. If you are interested please send info and resume to email or comtact me at Anne Marchand, 202.265.5882 x2 for details. Please leave a message. What Comes Next, a new series of photographs by artist John Trevino. In his work, Trevino examines dreams and memory created as the residual of human interaction. These images build on that theme by documenting his friends, colleagues, and acquaintances wearing water polo caps customized by the artist. Worn on players' heads during water polo matches, caps take the place of jerseys in other team sports. As a form, they represent striking juxtapositions in design, part helmet, part Little Red Robin Hood. This "tough sensitivity" also characterizes much of the sport itself which itself can be quite brutal yet at times exhibits the gracefulness of a ballet. Taken out of this context, Trevino transforms the caps and the wearers into a strange and mysterious collective force or team on the verge of some kind of unknown action. Captured against environments Trevino frequents around Washington, D.C. as part of his routine, the work becomes a meditation on those locations and the people in his life. John currently lives in Hyattsville, MD and teaches painting and drawing at Howard University. Sept. 5th - Sept. 30, 2008. Recent paintings by Francine Shore and prints by Bianca O'Keefe inspired by the Spanish Colonial Architecture of Mexico. Helicopters without rotors encounter ‘kite-eating’ trees as Carlson’s cheerfully ominous paintings explore themes of power and vulnerability. 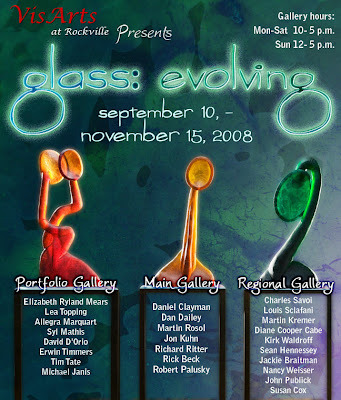 This exhibition is sponsored by Akridge and Seaton Benkowski Partners in collaboration with Hemphill Fine Arts. The artists in this show each have a singular vision, manipulate color and light, and work in three dimensions with canvas, metal, tapestry items, and mixed-media. Marc Bianchi, Brice Bischoff, Jacob Borndal, Kyle Bravo & Jenny Leblanc, Lauren Castle, Chin Music Press, Lisa Choinacky, Mike Combs, Constance, Beth Dary, Dirty Coast, Aubrey Edwards, Courtney Egan, Skylar Fein, Abby Gitlitz, Kevin Golden, David Grant, Jenny Hart, Brad Jensen, Kid Camera Project, Miranda Lake, Kristin Littwin, Leo McGovern & Jason Reeves, Neighborhood Story Project, New Orleans Craft Mafia, Royce Osborn, Marlowe Parker, JR Portman, Matthew Bonifacio Rodriguez, Megan Roniger, Beth Schindler & Summer Bethea, Dread Scott, Tabitha Soren, Elizabeth Underwood, David Wingo and JT Yost. Angela White is exibiting in a group show at the Yellow Barn Gallery at Glen Echo. (this is the intersection of Goldsboro Rd and MacArthur Blvd). With plastic resin and paints, Anthony Cervino transforms the parts taken from toy model kits, into low-relief sculptures on canvas. Not quite wall sculptures and not quite paintings, these chromatically reductive works are evocative of architectural structures, disaster scenes, and abstract landscapes. With the focus on Green, our fair city is geared up to have a dialogue with world capital city planning officials on strategies for sustaining the built and natural environments of treasured capital cities. Hosted by the National Capital Planning Commission in partnership with the U.S. Commission of Fine Arts and the National Building Museum. Delegates from more than 50 capital cities have been invited to participate. The event will be the sixth gathering of the Alliance since its creation in 2001. Public sessions begin Monday, September 15 and run through Thursday, September 18. If you are a member of the general public and wish to reserve seating for a conference session, please RSVP by September 5, 2008. Discussions and workshops will be devoted to topics such as building community support for green and sustainable policies; addressing the challenges facing capital cities; balancing tourism and responsible energy consumption; and the effect of green design on world-class architecture and open space.